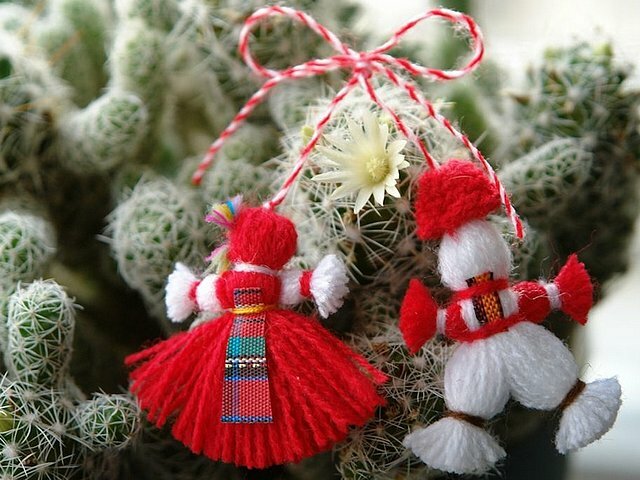 Beautiful Bulgarian martenitsa with two dolls Pijo and Penda made of white and red yarn on a blooming cactus. Pijo is a male doll, usually predominantly in white, while Penda is a female doll, which is distinguished by red skirt. According to the Bulgarian folklore, red and white woven threads symbolize the wish for good health. They are the heralds of the coming of spring and of the new life.